Anyone who has faced a frame construction at some point has to think about which insulation is better for a frame house. To make the right decision, it is necessary to know the properties of the main thermal insulation materials offered by the modern market. In addition, the rules on which their choice is based should be considered. After reading this article, you can consciously and competently choose the most suitable insulation material for warming the walls of a frame house. The ability of a material to transfer heat displays a coefficient of thermal conductivity. The lower its value, the less heat passes through this material. At the same time, in winter the room does not cool down so quickly, and in summer it heats up more slowly. This provides savings on cooling and heating. For this reason, when choosing insulation, it is necessary to take into account the value of the coefficient of thermal conductivity of the material during operation in specific conditions. The next important indicator affecting the ability of a heater to retain heat is its water absorption. It represents the ratio of the amount of water absorbed by the heater to the mass of the heater itself. This characteristic demonstrates the ability in the case of direct contact with water to absorb and retain moisture in the pores. Due to the fact that the wet material conducts heat well, the smaller this quantity is, the better. This is explained by the fact that when wet, the air pores of the insulation are filled with water, which has a higher thermal conductivity than air. In addition, too wet material can simply freeze, becoming ice and completely lose its function. Fire safety of materials means the ability to withstand high temperatures without disturbing the structure and ignition. This parameter is regulated by GOST 30244, GOST 30402 and SNiP 21-01-97, which subdivide them into flammability groups from G1 to G4, while completely non-combustible substances are designated NG. For frame houses, insulators belonging to the NG group are most preferable. When choosing a heat insulator for a frame building, it is necessary to take into account such an indicator as the ability to shrink. This value should be minimal, otherwise in the process of operation in the places of laying insulation a material subsidence will appear, which will lead to the emergence of cold bridges and an increase in heat loss. 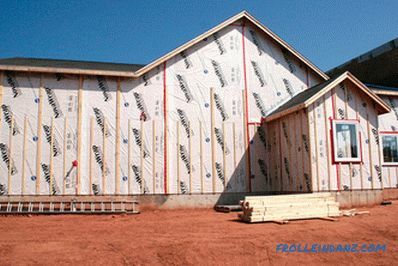 The basis of the walls of a frame house is insulation. Since the insulation material will surround you in the frame house everywhere, you need to be sure that this is really high-quality insulation and it does not emit harmful substances. The market offers a huge assortment of insulation materials of various types and types. The frame house is a building made of wood and materials made of wood. In the case of wooden buildings, the value of vapor permeability of insulation, which should not be lower than that of the type of wood from which the frame is made, is of crucial importance. In most cases, conifers are used to build houses, with a vapor permeability of 0.32 Mg / (mx hx Pa). 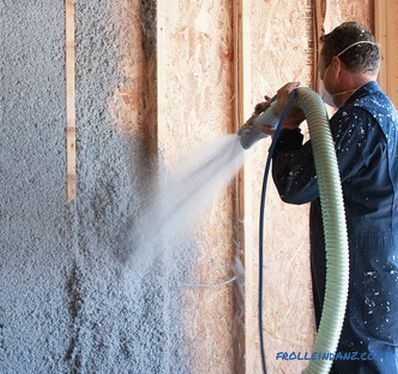 In order to visually substantiate which insulation for the walls of a frame house is better, consider the vapor permeability of the most popular thermal insulation materials. Obviously, the 5 materials listed at the beginning of the graph are not suitable for warming the frame construction due to the low vapor permeability value. Their use causes sealing of heat-insulated surfaces or structures, and the buoyancy perfectly illustrates the lack of ability to pass steam. This is important! 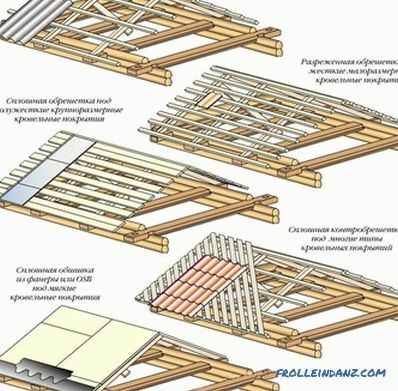 Under no circumstances it is recommended to warm the frame house with foam plastic and its derivatives. As you can see, mineral wool has the highest vapor permeability, and eco wool has the same value as wood. Therefore, both of these materials can be used for insulation of houses with wooden frames. Fibrous insulation material, known to all as mineral wool, today makes up about 70% of the total thermal insulation used. Mineral wool insulation is made from various raw materials and, depending on this, has certain properties. Minvat is environmentally friendly, has a low weight, has the desired degree of vapor permeability and is resistant to pests. A valuable property for frame houses is its fire safety. The disadvantage of mineral wool, which must be considered when choosing, is hygroscopicity. Despite this, it is possible to use it when warming frame structures, but with the mandatory use of vapor barrier and waterproofing membranes, let's talk about this a little lower. 1. Basalt (stone) wool . As a raw material for the production of stone-cotton heaters, there are various rocks - basalt, basalite, diarrhea, porphyrite. Since basalt is the leader in this list, all stone wool material is often called basalt wool, which is not quite true. This name should be given only to those varieties that are produced directly from the basalt itself, but they have a different scope. They are used not for insulation of walls and residential structures, but for insulation of pipelines and process equipment. Stone wool is a completely non-combustible material with high thermal insulation qualities, characterized by durability. The total duration of his service is close to 50 years, while he is able to maintain unchanged their valuable properties throughout this time. Kamennovatnye (basalt) heaters have a negligible shrinkage. Their dimensions are able to remain unchanged during the entire period of operation of the building. As a result, cold bridges do not appear at the junctions of the insulation plates. Materials of this group can withstand temperatures up to 1000 ° C without melting and deforming. Such heaters have pronounced water-repellent properties due to hydrophobic additives. As a result, the moisture falling on their surface does not willingly penetrate inside, and that part of it, which air contains in the form of fumes, does not linger in the thick layers of insulation, but can freely pass through them. Stone wool is produced in the form of slabs. In the case of frame buildings, heat-insulating plates made of materials with a density of 35-50 kg / m³ are considered optimal. The width of the plates should be 1-3 cm greater than the distance between the racks, which allows you to install the plates tightly and without gaps. A very technological solution is the use of the Izolayt and Izolayt-L heat-insulating plates manufactured by ISOROC, the leader in the production of basalt heat insulation. 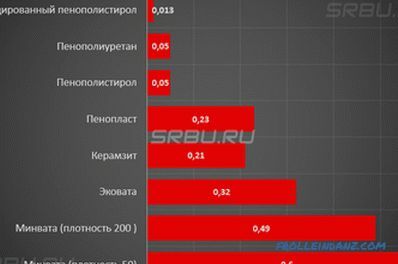 Among other well-known manufacturers of similar materials present in the Russian markets, it should be noted ROCKWALL, PAROC, Nobasil. 2. Glass wool (fiberglass-based insulation) . Glass wool has many common properties with basalt wool, but at the same time, they have serious differences. For its production is used raw materials used in the manufacture of glass, as well as the resulting waste. It does not look like plates, but rolls, which consist of individual strips of various sizes, called mats. Their approximate dimensions - length 10 m, width 1, 2 m, thickness 100 mm. When insulating frame structures, it is recommended to use insulation with a density of 15-20 kg / m³. For maximum effect, each material should be used only for its intended purpose. Therefore, in order to save, it is not allowed to purchase a heater of lower density, which has a lower cost. It can only be used for horizontal surfaces, such as floors. Before installation, glass wool is cut into strips of the required size, which should be 15-25 mm longer than the distance between the racks, which allows placing it "in thrust". The material is well kept on the frame due to its low weight and the presence of long springy fibers. It is distinguished by the lack of ecological glass fiber, because of which its use is often rejected in favor of stone wool. It is necessary to work with it only in a respirator and gloves. Certificates claim that with full compliance with all the requirements of the technology, which is so rare in practice, it does not pose a threat to health. In addition, glass wool has the ability to a certain degree of shrinkage. As a result, over time, voids arise in the frame, creating cold bridges. The disadvantages include increased water absorption of the material, actually reaching 12-15%. 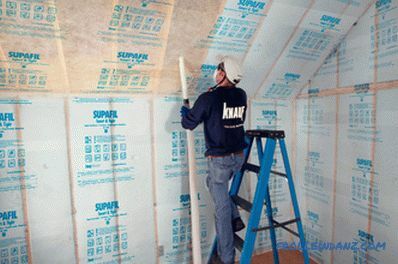 In modern construction, glass wool of brands such as ISOVER, Knauf Insulation, URSA is often used. Slag insulation is currently rarely used. The raw materials for their production are blast furnace slag and metallurgical production wastes. Although they have low cost and not too high thermal conductivity, they are practically not used where they want to achieve environmental friendliness and durability of the structure. This is explained by the fact that the insulation of this type is very fragile and fragile, their shape is not restored after mechanical effects. Since the manufacturing technology does not allow adding hydrophobic substances to their composition, they have a high water absorption. In the production of slag insulation use phenyl-formaldehyde components that are harmful to humans. This is a modern insulation based on cellulose, which is well suited for thermal insulation of a frame house. It differs from mineral wool in appearance and installation methods. This material is not flammable, does not emit toxic substances when ignited. 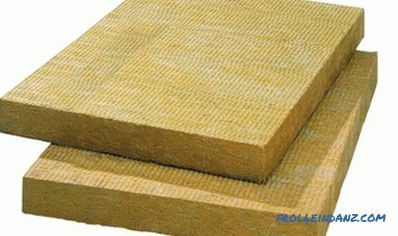 It has a high sound insulation, 2 times higher than that of the mineral wool. 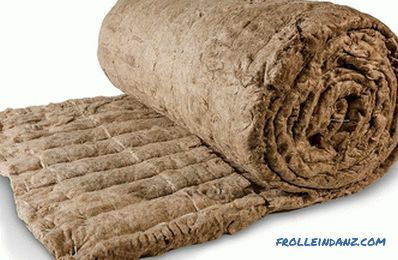 It is widely used also for insulation of offices, production and residential premises, trade pavilions, warehouses. It is advisable to use eco-wool in places with high humidity and the risk of condensation. The only disadvantage is the high cost of the material and the need for special equipment for installation. various waste paper - old books, magazines, newspapers. The latter type of raw material is attributed to the second grade because it is too heterogeneous and subject to contamination. 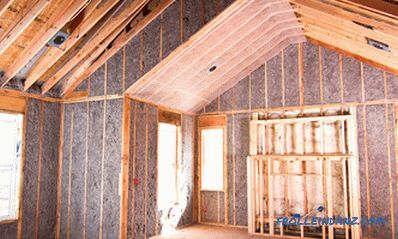 The volume of the thermal insulation material obtained consists of 80% cellulose fibers, 12% of boric acid, which protects it from fungi and bacteria, and sodium tetraborate, which is a fire retardant, takes 8%. This component not only increases the fire resistance of the material, but also enhances the insecticidal properties. When moistened, ecowool fibers become sticky, which is due to the lignin contained in them. For blowing cotton using the dry method, special equipment is used. Ecowool is supplied through a special hose, the operator can direct the hose into different cavities and fill them with ecowool. Using the dry method, heat insulation of attics, ceilings, internal surfaces of roofs and floors is carried out. The wet method is convenient to apply when the insulated surface is subsequently sheathed. In this case, water is added to the composition and the resulting mass is sprayed onto the surface of the walls. Upon drying, the resulting mixture forms a dense heat-shielding layer. The advantage of the wet method is the lack of shrinkage and large amounts of dust during cleaning. Wet application of eco wool. The glue method is used when insulating structures made of metal or reinforced concrete, which, for example, include ceilings and walls of hangars. Due to the high adhesion of the adhesive composition, its layer adheres perfectly to the surface to be protected. Due to the strength and hygroscopicity of the coating, no additional plating is required. Stone (basalt) wool or ecowool, which is better for warming a frame house? when using wet - adhesive method for thermal insulation of walls. When insulating an inclined roof between the rafters in the lower part of the ramps, you need to install "plugs" that will not allow the Ecowool to go beyond the boundaries of the thermal circuit. At the bottom of the rafters, under the vapor barrier, you will need to create a horizontal supporting sheathing. When we wall the walls using the dry-blowing method , after the completion of the work, it is necessary to restore the technological holes through which the material was blown. But this will be required only if the frame inside is sheathed with panel material.In those cases, when the shell is made of the inside of the frame only by the membrane, it is necessary to manufacture supporting sheathing. The application of the wet-glue method before the subsequent covering from the inside requires time and control over drying. 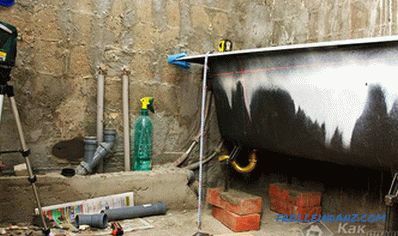 When using ecowool, backfilling cannot be done manually, since there is a high probability of disturbing the backfill density. As a consequence, there will be insufficient insulation and shrinkage of the material. When we use eco-wool, it is important to choose a good company that has modern equipment for ecowool blowing. If there is an opportunity to entrust the installation of eco-wool to a reliable performer, make a choice between eco-wool and stone cotton wool If there is no confidence in the high quality of work of installers, it is better to give preference to basalt wool. 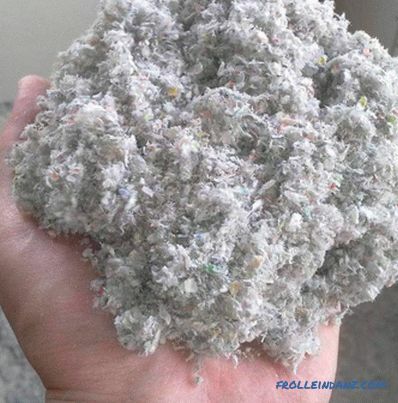 Ecowool, is a relatively new material, relatively mineral wool, which has been used for a long time, and the insulation technology has long been tested. 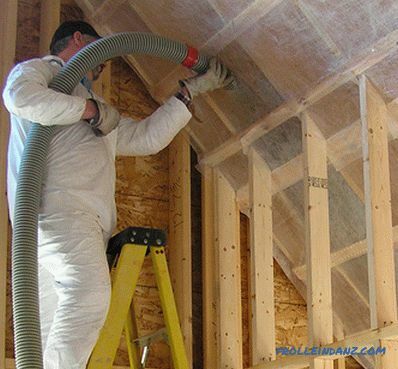 is important Vapor barrier is necessary to protect the heat-insulating layer of mineral wool from the effects of moisture and fumes coming from inside the room. The quality of the entire insulation system depends on the quality of the device and the performance of the vapor barrier. It is advisable to entrust its implementation to professionals or, at least, to accurately fulfill all the recommendations of manufacturers of steam and heat insulating materials. Mineral wool insulation needs to be protected from the outside. A thick wool sweater can not always protect its wearer from the wind. But it is worth wearing a windbreaker over it from a thin, but not blown fabric, it immediately becomes warm and cozy. Similar to this, a layer of insulation will reliably retain heat only when protected by a reliable hydro-windproof membrane fixed outside. At the same time, wind protection not only helps to preserve heat inside the building, but also prevents the weathering of the fibers of the insulating material and also protects it from atmospheric moisture. The material used to protect against wind must not only trap moisture and cold air coming from the outside, but also allow water vapor to flow through the insulation from the inside unhindered. In other words, it must simultaneously have vapor permeability and airtightness. After all, moisture, getting inside the insulation, significantly reduces its thermal insulation characteristics, and when negative temperatures appear outside, the insulation begins to freeze. In order to protect against these factors, multi-layered modern hydro and windproof membranes are used. They create the most favorable conditions not only for the functioning of the insulation, but also for people living in the building. At the same time it is very important to observe the technology of their installation. It is unacceptable to use polyethylene or any other film that contributes to the appearance of a "thermos effect" inside the building. In addition, their use in addition to unprofessional installation may lead to the loss of mineral wool insulation in all dimensions of the structure.